Background: Respiratory care (RC) is an allied health profession that involves assessing and treating patients who have pulmonary diseases. Research indicates that respiratory therapists' (RT's) involvement in caring for patients with respiratory disorders improves important outcome measures. In Kingdome of Saudi Arabia (KSA), RC has been practiced by RTs for more than 30 years. Objective: We sought to investigate the status of the RC workforce in Saudi Arabia in terms of demographic distribution, number, education, and RC service coverage. Methods: We used a specially designed survey to collect data. A list of 411 working hospitals in KSA was obtained. All hospitals were contacted to inquire if RC is practiced by RTs. Data were collected from hospitals that employ RTs. Results: Only 88 hospitals, 21.4% of total hospitals in the country, have RTs. Out of the 244 Ministry of Health (MOH) hospitals, only 31 hospitals (12.7%) employ RTs. There are 1,477 active RTs in KSA. Twenty-five percent of them, or 371, are Saudis. The majority of the RT workforce (60%) work for non-MOH government hospitals, and almost half the total RTs work in Riyadh province. About 60% of RTs work in critical care settings. RC coverage of critical care was 44.5% of ideal. The overall RT-to-ICU bed ratio was 1:11. The ratio was 1:9 for non-MOH government hospitals, and 1:20 for MOH hospitals. Conclusions: We report the first insightful data on RC workforce in KSA. These data should be used by educational institutions and health policy makers to plan better RC coverage in the country. RC has been practiced as a specialty in Saudi Arabia (KSA) since mid-1970s when Military hospital in Riyadh introduced RC services, and sponsored scholarships to train Saudi nationals in RC in the USA. Since then, several training programs and scholarships have been introduced to graduate qualified RTs to meet the increasing demand for RC services. In addition, the Ministry of Health (MOH) and the private health sector started to include RC services in their hospitals by recruiting Saudis and expatriate RTs. Moreover, hospitals seeking recognition by national and international accreditation authorities have started to implement RC services by qualified RTs to conform to the accreditation requirements. Official reports indicate that the Saudi nationals represent 66.7% of current allied health workforce in the Kingdome. The report does not provide data on individual disciplines of allied health. To the best of our knowledge, the status of RTs in Saudi Arabia in terms of workforce supply and demand, coverage, and distribution has not been investigated. This descriptive survey study was performed to provide a general profile of RTs in Saudi Arabia in terms of demographics, educational levels, credentialing, scope of coverage, and distribution per geographic area and health sector. A survey was designed to collect related information from RC departments throughout KSA. Before developing the survey, we reviewed literature relevant to healthcare workforce studies. Of special interest, we thoroughly reviewed the Respiratory Therapists Human Resources Study conducted by the American Association for Respiratory Care  to obtain background information on study design and content. Our survey was reviewed by three RC experts for face validity and readability. The survey was self-administered, anonymous, with 12 items inquiring about hospital geographical location, type of hospital, bed capacity, number of intensive care units (ICUs), number of ICU beds, number of RTs, their gender, nationality, educational levels, professional credentials, and whether they work in an RT department/unit or under other clinical department. The survey was reviewed and approved by our Research Committee on the stipulation that collected data will be anonymous and unidentifiable. A list of hospital names and contacts were retrieved from internet websites of MOH, Air Force Medical Services (AFMS), and National Guard Health Affairs (NGHA). Lists of private and other government hospitals were obtained from the Saudi Food and Drug Administration (SFDA) website, or individual hospital website when needed. A final list of 411 hospitals was obtained. We contacted all hospitals via telephone to inquire whether RC services in their respective facilities are provided by RTs. Data were only gathered from hospitals in which RC services are provided by RTs. Data collection was performed by the author and a team of seven assistants. The survey was sent via email to hospitals employing RTs. Non-responders were reminded by emails and/or phone calls. Personal visits to some hospitals were needed to complete data gathering. Surveyed hospitals were classified into three sectors: MOH, non-MOH governmental, and private. Non-MOH governmental hospitals include hospitals run by AFMS, NGHA, Security Forces, Universities, Royal Commission of Jubal and Yanbu, Saudi Oil Company (ARAMCO), and King Faial Specialist hospitals. The Kingdome of Saudi Arabia is composed of 13 provinces. For this study, the 13 provinces were clustered into five geographical areas: West (Makkak and Al-Madinah provinces), East (Eastern province), Central (Riyadh and Al-Qassim provinces), North (Hayel, Northern Border, Al-Jouf, and Tabuk provinces), and South (Al-Baha, Asir, Jazan, and Najran provinces). Data collection occurred between January and April 2011. Data were coded, entered, and analyzed using descriptive statistical methods with Microsoft Excel (MS-Excel, 2007). The number of current workforce, demographic distribution, level of education, and comparisons per health sector and geographical area are reported in this study. We also calculated current and ideal RT's coverage of intensive care units. Comparisons with available data from USA and Canada are also presented in this study. In total, 411 hospitals were surveyed in this study. [Table 1] shows number of hospitals in KAS per health sector and geographical areas, and number of hospitals that employ RTs. About 60% (n = 244) of working hospitals in KSA are owned and operated by MOH. The largest number of hospitals are located in the Western part of the Kingdome (126 hospitals), while the Northern area has the least number of hospitals (40 hospitals) compared to other areas of the country. Out of 411 hospitals in KSA, only 88 hospitals provide RC services by RTs, which represent 21.4% of total number of working hospitals in the country. Seventy percent (70%) of non-MOH government hospitals employ RTs. Only 13% (n = 31) of MOH hospitals have RTs, while about one quarter of private hospitals employ RTs. Although 88 hospitals provide RC services via RTs, only 38 of them have RC departments or units. In the other 50 hospitals, RTs function under other department or units, such as ICU, nursing, anesthesia, or physical therapy. [Table 2] depicts some important demographic data. The total number of active RTs in Saudi Arabia was 1,477. About 60% of them (n = 885) work for non-MOH government hospitals. In the 31 MOH hospitals that have RTs, there are 379 RTs. Only 213 RTs work for 31 private hospitals. The gender of the RT workforce in KSA is comprised of 785 females (53%) and 692 males (47%). We studied the distribution of RT workforce per geographical areas of the country and results are shown in [Table 3]. About half of the total RTs work in the central part of the country (n = 733). Only 337 and 334 RTs work in Eastern and Western provinces, respectively. Out of the total 371 Saudi RTs, about 47% (n = 174) work in the Central region, 30% in the Eastern province, and about 20% in the Western region of the country. This survey reported only nine and five Saudi RTs in the northern and southern parts of the country, respectively. [Figure 1] depicts the nationality of RC workforce in the Kingdome. 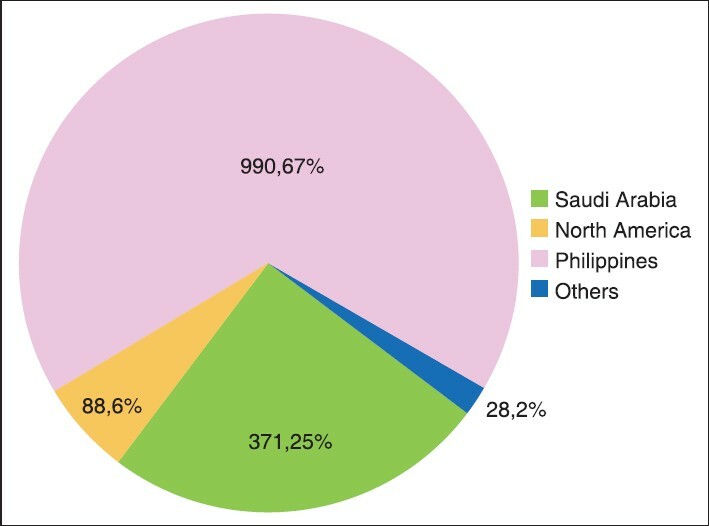 One quarter of total RT workforce in the country are Saudi nationals (n = 371), while the majority (67%, n = 990) are from Philippines. Only 88 (6%) RTs from USA or Canada work in the Kingdome. We also studied type of services provided by RTs in the Kingdome [Figure 2] and found that majority of RTs work in the intensive care units (59.4%), followed by general care (22%), administration (6.7%), and diagnostics (pulmonary function testing and sleep studies) (5.7%). Educational level of RTs in KSA was also investigated. About 70% (n = 1030) of RTs in the country have baccalaureate degree (BS) in RC. Other educational levels are as follow: On-job training 5.4% (n = 80), certificate 3.7% (n = 55), diploma 19.7% (n = 292), and master degree or higher 1.4% (n = 20). The National Board for Respiratory Care (NBRC) is an American agency that offers certification (CRT) and registration (RRT) exams for the RTs. Only 159 (11%) of RT workforce in KSA are registered by the NBRC. Number of certified RTs are 54 (4%), and the remaining 1,264 RTs (85%) do not have credentials by NBRC. Educational level and NBRC credentials are shown in [Table 4]. RC coverage of the intensive care was investigated in this study. Number of ICUs in the 88 hospitals that employ RTs was 228 with bed capacity of 3,539. Average bed capacity per ICU was 15.5. 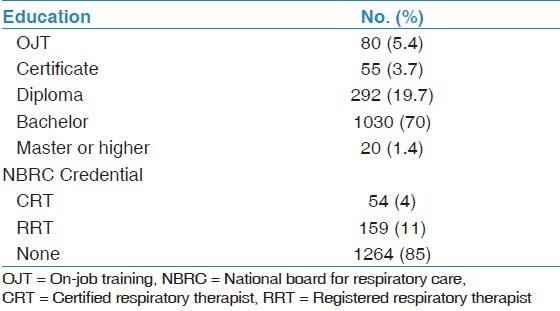 [Table 5] shows actual and ideal coverage of respiratory services in the ICUs. The central region of KSA has the best coverage of one RT for every eight ICU beds, while shortage of RC personnel in the Southern region of the country makes the ratio 1:32. The overall ratio of RT-to-ICU bed is 1:11 with a percent coverage of 44.5% of what is necessary to achieve the recommended ratio of 1:5. The ratio of RT-to-ICU bed per health sector is shown in [Figure 3]. 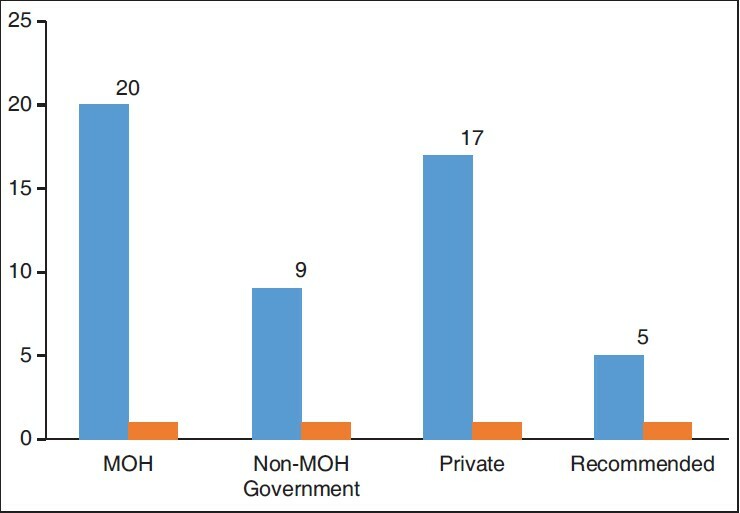 Non-MOH governmental hospitals achieved a ratio of 1:9, while it was 1:20 and 1:17 in MOH and private hospitals, respectively. Out of total 411 hospitals in Saudi Arabia, only 88 hospitals provide RC services by RTs. There are 1,477 RTs in KSA, 25% of them are Saudi nationals. Actual RT-to-ICU bed ratio is 1:11. Our study revealed an important and interesting finding that 323 (78.6%) hospitals in Kingdome do not have RTs. Only 88 hospitals provide RC services by RTs. The fact that RC services are provided by RTs in only one-fifth of total hospitals in the country can be attributed to the following reasons. First, RC profession is relatively new in KSA, precluding adopting this profession in many hospitals. Second, shortages of RTs in the market made some hospitals to provide RC services by other health care providers, such as physicians and nurses. Third, in MOH, which runs 244 hospitals (60% of total KSA hospitals), there is no official job title for RTs at the time of this study. This hinders recruiting RTs to work in MOH hospitals. Our study showed that only 13% of MOH hospitals employ 379 RTs, representing one quarter of total RT workforce. It is an alarming finding to know that the remaining 213 MOH hospitals provide RC services using non-RC staff. Quality and efficiency of RC services warrant a thorough revision in these hospitals. Because of a lack of RTs and low visibility of the profession among hospital administrators, 50 of the 88 hospitals that employ RTs do not have RC departments or units. In these 50 hospitals, RTs work under other departments or units, such as intensive care, pulmonary, or nursing. Lack of experienced RTs with administrative skills could be a justification for some hospitals not to establish RC departments or units. Training of RC professionals in KSA started in mid-1970s when the Military hospital in Riyadh sponsored some Saudis to study RC in the USA. In 1991, National Guard health affairs also sponsored similar scholarships to the US to train RTs. The first RC academic program was started in 1987 in Military hospital in Riyadh in collaboration with Loma Linda University (Dr. Richard Nelson, November 2011). This program was a 3-year didactic and clinical training ending with an associate degree (AS) in RC. The last batch of this program graduated in 2001 after which the program closed. In 1988, Prince Sultan Military College of Health Sciences in Dhahran started its AS degree program in RC, which was upgraded to BS-degree program in 2007. In 1999, University of Dammam initiated the first BS-RC program in the country. These educational endeavors are too few to produce sufficient numbers of RTs to meet increased demand for RC services in the country. In this study, we reported 371 Saudi RTs, representing only one-quarter of total RC workforce in KSA. Obviously, there is a critical need for more RC educational programs in KSA. At the time of this study (2011), there were only two RC academic programs. As of this writing, there are six BS-RC programs; two of them are private colleges. Our study indicated that 53% (n = 785) of RC workforce are female. Since its inception, University of Dammam RC program admits female students. This could explain this gender proportion of RC workforce. Regarding educational level, 70% (n = 1,030) of RTs working in KSA are BS degree holders. In USA, only 32.8% of RTs have BS degree. This higher educational level of RTs as compared to the USA can be explained by the fact that majority of RC workforce (67%, n = 990) in KSA come from Philippines, holding BS degrees. Other contributing factors include the establishment of a bachelor degree program in KSA since 1999, and government scholarships allowing Saudi RTs who hold diploma or associate degrees to pursue education for BS degree in RC. On the other hand, 5.4% of the RC workforce practices RC without sufficient training and qualifications. Those are usually healthcare providers with backgrounds in nursing or anesthesia who received short (3-6 months) and unstructured training in RC. Some hospitals, mainly MOH, embraced this kind of training in attempt to meet the demand for RTs. Considering the duration and setting of this kind of education, we question the quality and eligibility of trainees in such programs to practice RC. Assessment and management skills of critically ill patients in relation to oxygenation and ventilation are core competencies for RTs. , Our study showed that almost 60% of RTs work in critical care areas. Ratio of RT-to-ICU in hospitals that employ RTs was 1:11. This finding is similar to the ratio reported by Mathews et al. who surveyed RC in critical care units in 51 US hospitals. They found that the actual critical care beds-to-RT was 10.75 to 1. Central region of KSA had the best ratio of one RT for every eight critical care beds. Fifty percent (50%) of the RT workforce is located in the central region because the number of tertiary and specialized hospitals is higher in Riyadh than any other parts of the country. This explains the relatively good ICU coverage by RTs in the central region of KSA. In order to assess the level of RTs coverage of critical care, we used a clinically reasonable ratio of 1:5 of RT-to-ICU beds, and an average of 70% ICU occupancy rate as reported in the literature. The current ICU coverage by RTs is 44.5% of ideal. There is a need for 1,225 RTs for optimal coverage of RC services in the ICUs of the 88 hospitals that employ RTs. Our data suggest that MOH and private hospitals are in need to improve respiratory critical care services in their hospitals. There are 20 and 17 ICU beds for every one RT in MOH and private hospitals, respectively. Research studies have shown that increased workload on healthcare providers in the ICUs was associated with higher mortality rates. , To illustrate extent of shortage for RTs in KSA, [Table 6] compares number of RTs in KSA with data reported from USA  and Canada. Although a crude index, the number of population per RT provides an impression on countrywide coverage of RTs. In KSA, there is one RT for every 17,629 persons of KSA population. The ratio is 1:2,136 in USA and 1:3,365 in Canada. The benefit of RTs in intensive and sub-acute care has been demonstrated in many research studies. When RC services are provided by qualified RTs, the cost of care is reduced and utilization of hospital resources is minimized. Duration of mechanical ventilation is less when RTs are involved in the weaning process. ,, These outcomes translate into lower ICU and hospital stays. Because of these advantageous benefits, many organizations adopted recommendations to have full-time RT coverage in critical care services. , The Saudi Central Board for Accreditation of Health Care Institutions (CBAHI) has included among its accreditation standards to have RTs in healthcare facilities as a requirement for accreditation. Standards enforced by CBAHI, coupled with the decision made by the Saudi Civil Services Council in 2012 to include job title for RTs in government salary scale are expected to increase recruitment of RTs. According to the MOH Health Statistical Year Book 2010  , the total working hospitals in KSA was 415. In this study, we surveyed 411 hospitals representing 99% of hospitals in the country. The number of hospitals surveyed in this research gives strength and validity to the results of this study. Our study is not free of limitations. Data was collected using a self-administered questionnaire. Although maximum effort was made to ensure accuracy of collected information, misunderstanding of some survey items or inaccuracy of some reported data cannot be completely excluded. To the best of our knowledge, this study is the first to investigate the status of RC profession in Saudi Arabia. Of the 1,477 RTs in KSA, 25% (n = 371) are Saudi nationals. Out of the 411 hospitals surveyed in Saudi Arabia, only 88 hospitals have RTs. These 88 hospitals have a 35,298 bed-capacity, representing 63% of total bed capacity in the country. This indicates that the employment of RTs is currently focused in large specialized hospitals. The role of RTs in sub-acute and rehabilitative care has been discussed in the literature. , In a country with high prevalence of chronic diseases (asthma, chronic obstructive pulmonary disease, and diabetes) ,, and exponential increase in healthcare services, the demand for RTs will continue to be high for the next decade. Notable differences are present in the distribution of the workforce among geographical areas of the country and among health sectors. Ministry of Health suffers more shortage of RTs than other health sectors. The expectation is that the new accreditation policies and recent changes in government job titles for RTs will help MOH and private sector hospitals recruit more Saudi-trained RC professionals. The results of this study should help education planners and healthcare policy makers to understand the current critical reality of RC profession in Saudi Arabia, and work toward bridging the gap between supply and demand for RTs in this country. I would like to thank Mr. Abdullah Albabtain, Mrs. Abigail Trinidad, Ms. Bashair Alfozan, Mr. Jose Navarossa Mr. Maher Alquaimi, Mr. Omar Alomar, and Mr. Yayha Alzahrani for their assistance in data collection. Mathews P, Drumheller L, Carlow JJ; Assistance of the American Association for Respiratory Care, National Board for Respiratory Care, Council on Accreditation of Respiratory Care. Respiratory care manpower issues. Crit Care Med 2006;34(3 Suppl):S32-45. Stoller JK. 2000 Donald F. Egan Scientific Lecture. Are respiratory therapists effective? Assessing the evidence. Respir Care 2001;46:56-66. Stoller JK. The effectiveness of respiratory care protocols. Respir Care 2004;49:761-5. Ministry of Health. Health Statistical Year Book 2010. Saudi Arabia. American Association for Respiratory Care. Respiratory Therapists Human Resources Study; 2009. Barnes TA, Gale DD, Kacmarek RM, Kageler WV. Competencies needed by graduate respiratory therapists in 2015 and beyond. Respir Care 2010;55:601-16. Kacmarek RM. Mechanical ventilation competencies of the respiratory therapist in 2015 and Beyond. Respir Care 2013;58:1087-96. Halpern NA, Pastores SM, Oropello JM, Kvetan V. Critical care medicine in the United States: Addressing the intensivist shortage and image of the specialty. Crit Care Med 2013;41:2754-61. Tarnow-Mordi WO, Hau C, Warden A, Shearer AJ. Hospital mortality in relation to staff workload: A 4-year study in an adult intensive-care unit. Lancet 2000;356:185-9. Tucker J. UK Neonatal Staffing Study Group. Patient volume, staffing, and workload in relation to risk-adjusted outcomes in a random stratified sample of UK neonatal intensive care units: A prospective evaluation. Lancet 2002;359:99-107. Canadian Institute for Health Information. Canada′s Health Care Providers 2011 Provincial Profiles: A Look at 27 Health Professions 2011. Available from: https://secure.cihi.ca/estore/productFamily.htm?locale=en&pf=PFC2160 [Last cited on 2012 Apr 16]. Kollef MH, Shapiro SD, Clinkscale D, Cracchiolo L, Clayton D, Wilner R, et al. The effect of respiratory therapist-initiated treatment protocols on patient outcomes and resource utilization. Chest 2000;117:467-75. Ely EW, Meade MO, Haponik EF, Kollef MH, Cook DJ, Guyatt GH, et al. 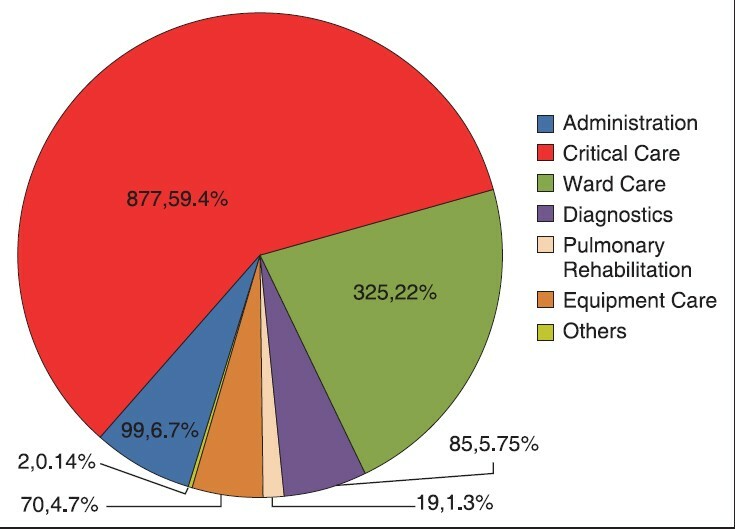 Mechanical ventilator weaning protocols driven by nonphysician health-care professionals: Evidence-based clinical practice guidelines. Chest 2001;120(6 Suppl):454-63S. Harbrecht BG, Delgado E, Tuttle RP, Cohen-Melamed MH, Saul MI, Valenta CA. Improved outcomes with routine respiratory therapist evaluation of non-intensive-care-unit surgery patients. Respir Care 2009;54:861-7. Brilli RJ, Spevetz A, Branson RD, Campbell GM, Cohen H, Dasta JF, et al; American College of Critical Care Medicine Task Force on Models of Critical Care Delivery. The American College of Critical Care Medicine Guidelines for the Defintion of an Intensivist and the Practice of Critical Care Medicine. Critical care delivery in the intensive care unit: Defining clinical roles and the best practice model. Crit Care Med 2001;29:2007-19. Haupt MT, Bekes CE, Brilli RJ, Carl LC, Gray AW, Jastremski MS, et al; Task Force of the American College of Critical Care Medicine, Society of Critical Care Medicine. Guidelines on critical care services and personnel: Recommendations based on a system of categorization of three levels of care. Crit Care Med 2003;31:2677-83. Saudi Health Services Council. Central Boad for Accreditation of Healthcare Institutions. Available from: http://www.cbahi.org/apps/en/home.aspx [Last cited on 2014 Jun 8]. Merendino D, Wissing DR. New roles for respiratory therapists: Expanding the scope of practice. Respir Care Clin N Am 2005;11:543-55. Myers TR. Thinking outside the box: Moving the respiratory care profession beyond the hospital walls. Respir Care 2013;58:1377-85.